John Battelle's Search Blog Does the Pebble Cause a Ripple In Apple’s Waters? Does the Pebble Cause a Ripple In Apple’s Waters? Ever since the Pebble watch became an cause célèbre in tech circles for its kickass Kickstarter moves (it’s raised almost $7mm dollars and counting), something’s been nagging me about the company and its product. It’s now Valley legend that the company had to turn to Kickstarter to get its working capital – more than 46,000 folks have backed Pebble, and will soon be proudly sporting their spiffy new iPhone-powered watches as a result. Clearly Pebble has won – both financially, as well as in the court of public opinion. I spoke to one early investor (through Y-Combinator) who had nothing but good things to say about the company and its founders. But why, I wondered, were mainstream VCs not backing Pebble once it became clear the company was on a path to success? The reasons I read in press coverage – that VCs tend to not like untested hardware/platform plays, that retail products have low margins, etc., all sounded reasonable, but not enough. In this environment, there had to be more going on. Now, I don’t know enough to claim this as anything more than a theory, but it’s a Friday, so allow me to speculate: Perhaps one reason VCs don’t want to invest in Pebble is because they fear Apple. Here’s why. If you watch the video explaining Pebble, it become pretty clear that the watch is, in essence, a new form factor for the iPhone. It’s smaller, it’s more use-case defined, but that’s what it is: A smaller mirror of your iPhone, strapped to you wrist. Pebble uses bluetooth connectivity to access the iPhone’s native capabilities, and then displays data, apps, and services on its high-resolution e-paper screen. It even has its own “app store” and (upcoming) SDK/API so people can write native apps to the device. I don’t know the answer to that question (and doubt Apple would answer my call asking such a question), so I’ll toss it out to you. What do you all think? Is Pebble playing with fire here? Would Apple ever change its developer terms of services to cut the new company off? Apple, in theory, loves peripherals (like the Nike+) that augment the features of their phone, so I’m not sure why they’d have a problem with it just because it has an incredibly specialized screen in it. They don’t seem to be trying to replace the standard modes of interaction with the iPhone, but are augmenting them, and in some ways extending the reach of the iPhone into other devices. I agree, in theory. But what happens when the world evolves, and form factors with it? I don’t think any of us think we’ll be carrying iPhone bricks around in ten years, right? Hardware is getting eaten by software, as they say…. I wonder if that’s why Google is focusing on those glasses — Android for handsets must feel more like playing catch-up than winning innovation for the long term to them. Soon many objects will be substrates for data…. Take a look at the iPod Nano. I can imagine Apple making something quite similar of course. The question is, will they let others do the same. I think the problem here is one of public perception/relation for Apple. In a world with little backlash they would stop it and now, however for the longest Apple was the “little” guy. How does that “little” guy shut down a publicly supported innovation they did not “openly” design first and not gain further branding as “big business” blocking innovation? Short answer is I doubt they can… the “big business” tag is inevitable.. but how will the public as a whole handle this? I don’t think Apple really makes decisions for anyone but Apple. At least, that’s my perception. I expect that Apple announces similar services with their new iPod Nano this fall. 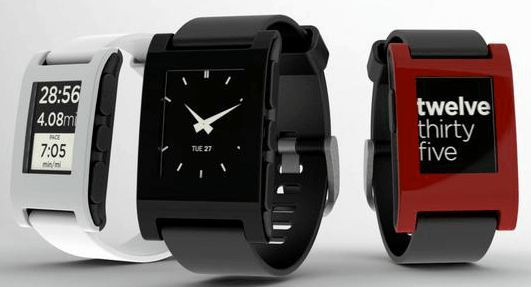 it would invigorate that segment and it is a good idea, as seen by the number of people who like the Pebble watch. Also, since Apple has designed watch faces already for people using the Nano as a watch…this seems like a opportunity for them. Basically, if you have the money, buy a Nano, otherwise buy a Pebble. The new Nano could also display something that the Pebble can’t: text messages. Ah. Interesting. So texts aren’t in the SDK? The Pebble can display Android texts just not iPhone. They will let them. They just won’t let them do it with the same level of integration and app connectivity as they sold supporters on. Pebble will have to adjust their plans. This will happen before they even launch and it will happen quietly. Apple doesn’t have to block them, they just have to marginalize them. They can also pounce with their own deeper integrated solution if they believe in the space. Pingback: Does Pebble Challenge Apple’s Hardware Game? Thats a very cool looking watch. Wow. Whois info for your domain. I think you may be spot on here. IF Apple says no then the company is pretty much out of business (i know they have Android) but their target customer is an iPhone user. If they can execute quickly, collect the profits they could be done and gone before Apple shuts them down. VCs don’t like companies with profits, or in this case a company with a clear path to profits and a straight forward business plan. VCs like companies like Instagram, because as they make no money, they can be valued at any ridiculous number and flipped, making the VCs a fortune. A small, profitable corporation can’t be valued at $1 billion, because it is easy to calculate that it will never generate a return on investment at that valuation. Oh my, such a cynic. Then again, I get your cynicism! Precisely. VCs seek a big return on investment. They would always rather bet on something with a possible 10000x ROI (ebay, instagram) than something with a guaranteed 5x ROI. Also, they have no interest in actually producing anything. The goal is to fund it for as short a period of time as possible, then sell it to a major company or just sell off their share. Pebble has absolutely nothing for a VC to be interested in. It’s not that simple. The Nest thermostat got financing. Good point…though I wonder if that’s because it might disrupt the entire HVAC business in time. I can’t imaging Apple getting into peripherals like Pebble – The market may be large for a startup but minuscule for Apple. They partner with Nike and allow millions of iDevice accessories without much hindrance. The Pebble’s a flyspeck in the scheme of things. Apple’s core, there rest are ancellary. I suspect that such a device, or a very close analogue, probably already exists deep within the core of Apple R&D (couldn’t resist…). The thing at which Apple has proven itself to be most adept at is evolving: drawing in materials, technologies (hardware, software and network) and identifying where different configurations of those technologies intersect with how people live, or, better yet, how they aspire to live, itself an ever evolving concept. On the scale at which Apple works, 46,000 prospective users in 33 days, give or take, probably means very little. Don’t let the magnifying effect of Kickstarter’s visibility and rising media prominence skew your judgement about what is for all intents and purposes an accessory, albeit a pretty elegant one. Accessories are very much a part of a part of Apple’s ecosystem, and I suspect they are welcomed. Where else but an Apple Store might one find the way to rationalize the purchase of a $500 “accessory” such as the Zeppelin Air or the like? Like any good shopkeeper, Apple is happy to have the mark-up, as well as a deep shelf of similar trinkets to mark-up. The fact is that Pebble is already quite handicapped on iOS. Besides limited access (compared to an Apple-built device), it is at a severe economic handicap. If Pebble hopes to build a paid 3rd party apps ecosystem, it will have to pay Apple’s 30% in-app purchase tax. If Pebble grows on the device (the most likely place) then Apple gets paid and likely squeezes Pebble’s “app revenue” pretty hard. All recent iDevices (iPhone 4S and the new iPad) ship with Ultra-Low power Bluetooth 4.0 and it would appear the installed base is primed to adopt pebble like features in the next iPod nano. We may be shifting away from consumers buying dedicated MP3 players but the market for Mobile Accessories is just getting started. In other words, the VCs were right, or wrong, in not backing Pebble? The VC’s were right in not financing pebble for iOS, it is a short term solution for a space I suspect Apple will enter. The experience of adding and buying watch apps and providing access to API’s that talk to iOS Apps will be tightly controlled by Apple. You want to read text messages on your watch? Well Pebble can’t do that with iOS. Seems like the most basic of features Apple wouldn’t give Pebble access to. Not sure what you’re saying here. Will Apple stop Pebble from talking to the iPhone over Bluetooth? I’m reasonably confident the answer to that is no. Will Apple create a product like the Pebble and crush the Pebble in the long run? Dunno. The Pebble has drawn in around $8M at about $100 each. Call it 80,000 units. Apple sold almost 8 Million iPods last quarter, in a declining market. Not sure 80,000 units of anything makes much of a dent in that number. Its certainly possible that Apple will update the nano and make it into a better and more flexible watch/companion for an iPhone in hopes of selling more. That’s been an option for a while now ever since they started putting clock faces in the thing. But would they do it BECAUSE of the Pebble? But then again, I think Apple’s done any number of things because of potential threats. My point is not that Pebble, per se, is a threat. But the idea of commoditizing the core iPhone functionality is. Bluetooth devices using anything other than a few, basic bluetooth “profiles” (interfaces), must use an Apple-approved bluetooth controller. Apple makes money from hardware sales of such devices as the Find Your Car Smarter device. If Apple wanted to control all hardware, they wouldn’t provide some case manufacturers with specs of unreleased models; they would build their own cases, chargers, et al, and prevent others from doing so. They HAVE done this with Macbook power adapters, by not licensing their proprietary technology, and even sometimes suing those who repurpose Apple’s own adapters in their design. I think where Pebble may come up against some resistance is getting their app into the App store so that it can manage the iOS side of the integration equation. They’re talking about an app store for the Pebble, which may need to use in-app purchasing and pay Apple their share in order to not get locked out of the store. Look at the issues right now with Dropbox enabled apps being rejected if they provide any path out to an account creation screen or purchasing system that’s outside of Apple’s own. As the device could only have extremely limited functionality with a web based app, they’ll need to get a native app approved, and that hopefully won’t be the first the Pebble team gets to see what Apple’s interest in their success is. All of that said, there looks to be about 55,000 Pebbles set to ship, and if even half of those are going to current iPhone customers, does Apple want to tarnish their reputation by roadblocking a product that 25,000 of its potentially more tech savvy customers are backing? Stuff like this really bothers me (the Dropbox examples). At what point is Apple snuffing innovation and individual freedoms? I actually think it is the logical next step for apple with the iPod nano. They already have the concept, now they just need to include the Bluetooth and wifi in the form factor, I’m sure that is their end goal. Including the additional clock faces for the nano I think was just the beginning… I think it is a case of watch this space and later this year apple will likely have a similar exciting product. Apple will face a monumental backlash if they block this. However, if in September they release their phone iPhone Nano watch Bluetooth gizmo, with colour hybrid e-ink style screen, then they will beat pebble at their own game. I use a nano watch now, and have ordered one of these. What I’d really like though, is the nano I have but linked with notification center, and a single push-hold Siri activation button on the front. Apple could so easily do this if they wish, and they’ve seen the success of the Nano/Pebble. I’ll enjoy my pebble when it arrived. I doubt Apple will kill it. If they do, they’ll probably face some kind of lawsuits from Angry mobs. Worst case, I may have to jailbreak, which I haven’t done so in years, in order for it to work. I’ve heard no mention of power consumption, which I think might matter if Apple were to attempt a competing product. The E-paper lets the Pebble spend most of its time asleep and apparently lets it run for 7 days between charges. Does E-paper have the resolution and behavior that Apple uses in its other devices? This might not matter to everyone, but it’s a selling point of the Pebble. As long as the Pebble sells more iPhones and doesn’t use unpublished APIs, I would think Apple would be happy to look the other way. The pebble is not an iPhone clone but just a second display if you will. I think they’ll do fine. And the correct one is…? Of course if you’re just an engineer who wants to be part of a kickass product, the definition of “fail” is rather different from a finance professional’s view of fail. This, as much as anything else, can explain why VCs and Kickstarter subscribers have such different opinions. Does anyone know if the folks behind Pebble enrolled in Apple’s MFi program when developing their device? This would probably make a big difference in Apple’s response to them. $7mm doesn’t actually seem like a lot of money for a hardware company to start-up. And a lot of that money is pegged to the initial run of products, which will be pretty expensive per unit…. They still might need some VC money to get over the hump, and woe to those who need it in an emergency situation. I would get a Pebble-like device in a heartbeat, if it even took that long. But the actual Pebble in it’s current form simply doesn’t offer enough integration to seal the deal. It’s missing something, or more accurately, someone, critical – and her name is Siri. I need to AT LEAST be able to set up and answer calls, and read as well as dictate texts. To do any of that right, you need full Siri integration. In my opinion, a wrist companion wouldn’t just give Siri more functionality, it would make it truly useful. If all of her services were merely a slight raise of the wrist to your face away, people would go from using it as a party trick, to truly depending on it. In the near future they could integrate a camera in the device and make FaceTime less awkward to use as well. And let’s not forget making driving safer. A device that’s strapped to your wrist would mean you could keep both hands on the wheel and your eyes forward while you answered a text or had one read to you. In short, the Pebble might do O.K., but the moment Apple releases a Nano with full Siri and data syncing with an iPhone, is the day the Pebble stops skipping across the lake and starts sinking. Yep. Kinda my point. It’s a comin. I think it’s much simpler than this: VCs see that this could make money, but also that this is not going to rule the world – it is going to remain a niche market forever. You’re right about Apple though: If this got too big, where a substantial percentage of iPhone owners would want one, then Apple will make something to compete with this. This is a good concept, and good company, and good business, but it’s not going to turn into a $Bn company. I hate that you pitch this as an “iPhone mirror for your wrist” when the pebble team specify very clearly that this is for both Android and iOS. While it is a competitor and Apple has a major share of the smartphone market, you shouldn’t turn away from the Android platform and pitch this as a focus on iphones. Is that really though bad journalism though? Perhaps it’s not, since Apple has only a few signature models and there are countless android models and no “the android/samsung/htc/etc/etc/etc watch” in mind, so I kind of understand the article. The wording makes it very badly presented however. If I were you I’d change it. You really seem like you are some kind of apple fanboy. I’m not turning away from Android. I’m glad it works with it, though that was not its initial pitch. And if you read my work, I think you’ll see I’m no fanboy. Pebble would probably be better off being the intelligent but platform agnostic wrist watch. That would get them some leverage even if apple pulled the plug.